Get ready to sing your heart out! Choir of Hearts is an inclusive singing group aimed at building self-confidence through using our voices. We will be working on musical skills such as matching pitches, clapping rhythms, reading music, learning the names of notes, and singing in rounds, unisons, and solos. singing for vocal health. We will be singing contemporary top 40 pop songs, and gearing up for a performances at the Community of Hearts’ and in the community! 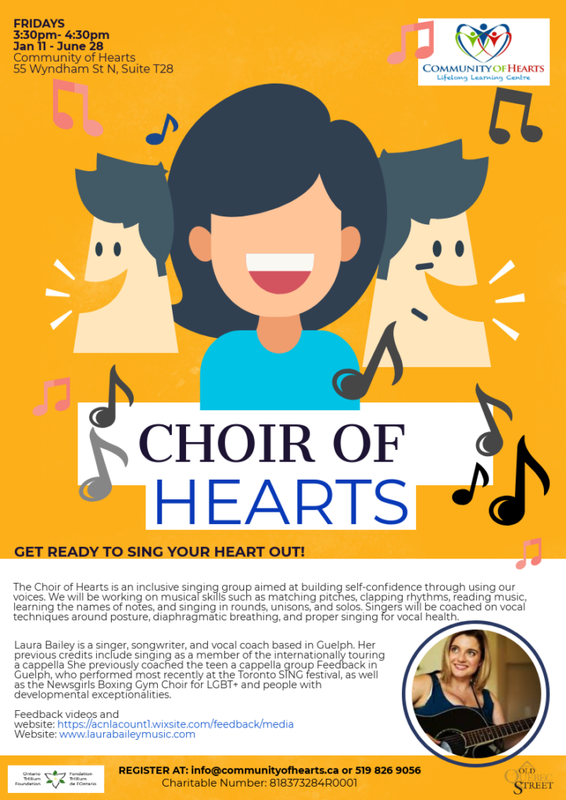 The choir will be coached by Laura Bailey, accomplished singer and vocal coach based in Guelph! Previous: Previous post: Art Make and Take with The Creation Station!